The Greater Hudson Chamber of Commerce held its Annual Dinner and Auction for Charity on Wednesday, December 6th where the evening included chances to win outstanding raffles along with an opportunity to bid on items part of the silent auction as well as coming together as a community for a cause! Check out the photos from the 2017 event! The Gr. Hudson Chamber and its members are proud to play an integral role as one its major donors for an organization that does so much for our community. The Chamber has been holding the Silent Auction to benefit the St. John Food Pantry for 18 years now and as a result of this annual event has contributed $79,000 aiding an organization that is dedicated to supporting our community. Members of the Greater Hudson Chamber of Commerce along with other local businesses donated wonderful items for raffle and the silent auction. The auction held many chances to win for all those in attendance but most important offers local business members an opportunity to generously support the community. The event is made possible with the support of sponsorship by local businesses. The food pantry continues to experience a dramatic increase in requests to assistance many families that range from single member households, struggling seniors on their own to families with many young children. They all share a common characteristic; they do not have enough financial resources to provide basic food, shelter and clothing. Most of the recipients are retirees on a fixed income while others are regular families struggling often due to unfortunate circumstances making it impossible to provide for all their family needs. How does the food pantry assist our community? There are so many ways they give hope to so many by helping provide food and gifts for 806 individuals; 352 are children and 74 are seniors; serving over 150,000 meals to date this year; supporting the “Feed Our Kids” Program which feeds over 95 school children each week so they have food on the weekends and during the summer months; brightens the holidays for over 200 families with special dinners and gifts; distributes hats, gloves and mittens to each member; every quarter families receive basic toiletries and household products; assists families in crisis with household goods and financial assistance; supports the town welfare office, police and fire departments with emergency aid, and so much more. Every ten dollars raised can purchase $100 worth of food from the NH food bank so every dollar counts! Anyone interested in further assisting the community through the Saint John XXIII Parish Food Pantry can make a contribution by contacting them directly at 882-2462 x6. The Gr. Hudson Chamber is appreciative of all those that donate, volunteer and support the event as well as all those that are able to attend. The Gr. 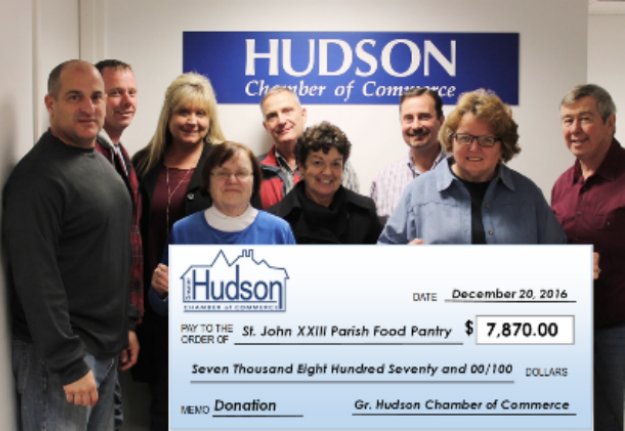 Hudson Chamber of Commerce is proud support the food pantry for all they contribute to our community.